There's something rotten in the state of New York, town of Rhinebeck. Not rotten, exactly; rather, festering and smoldering. Ghosts of the past and ghosts of the soon-to-be future, mixed with resentment and malaise. 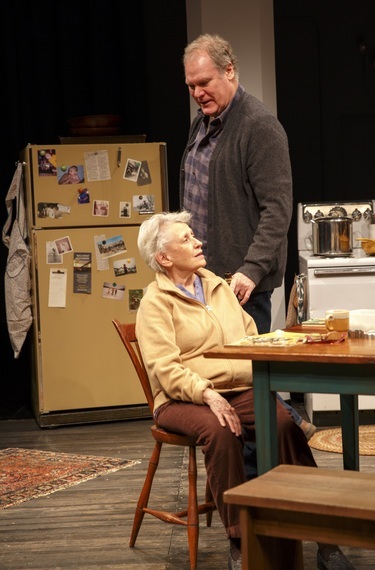 Playwright/director Richard Nelson ends his masterly trilogy, The Gabriels: Election Year in the Life of One Family, with Women of a Certain Age. The Gabriel family, who have been precariously slipping from the comfortable life they have enjoyed for generations, encountered difficulties in Hungry (which took place and opened on March 4) and stood near the brink of financial catastrophe in What Did You Expect? (which took place and opened on September 10). 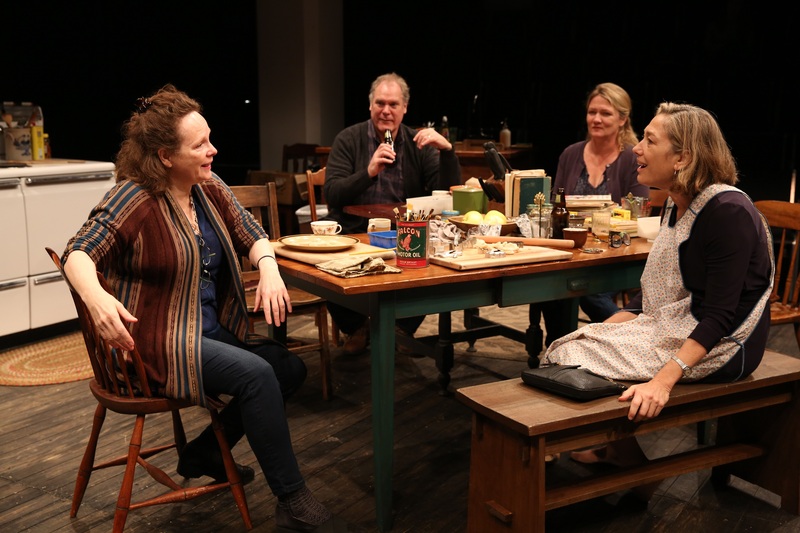 The proceedings of Women of a Certain Age (which takes place and opened yesterday, on Election Day) conclude at about 7 P.M., which is to say after the characters voted--presumably for Hillary, with assorted misgivings--but before the polls closed. (Nelson seems to have finished his up-to-the minute rewrites in time for an afternoon rehearsal, giving the actors time to absorb the final changes.) So Women of a Certain Age doesn't dissolve into the tragedy it might well have been had it opened today. But the financial catastrophe overwhelms all the Gabriels. George, a carpenter and music teacher, can't make ends meet; Hannah, a caterer, has taken work cleaning rooms in a nearby hotel (where she is the only English-speaking maid); and Mary, a physician who stopped working to take care of her husband during his long terminal illness, discovers that she is unable to renew her medical license--and that her out-of-town daughter from her first marriage has forbidden her to move in. As the play (and the trilogy) ends, Mary hears music playing on the revered family piano in the offstage living room. But they sold the piano in September, in What Did You Expect? Didn't they?? Nelson's writing, as in his earlier and thematically similar Apple Family Plays, is skillful, insightful and steeped in heightened reality. (While the target audience is likely to have little in common with any of the Gabriels--except, perhaps, the deceased Thomas--they will recognize all the characters; you're likely to feel like you are sitting in your family kitchen, interacting and baiting and squabbling with your own grown-up siblings.) 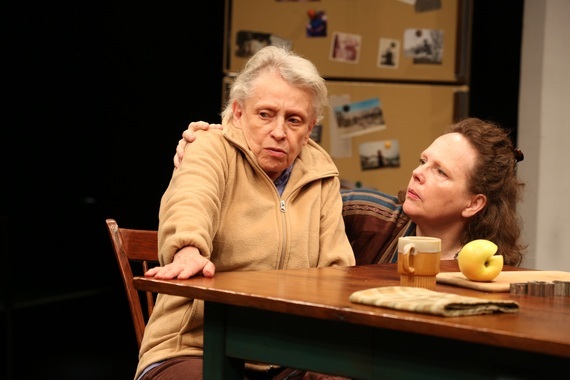 The Public has afforded Nelson the unprecedented opportunity to write and direct these two cycles, a total of seven plays over seven years, with each cycle populated by an impressive and devoted cast. (The married couple of Plunkett & Sanders appeared in all the plays, as Apples in the first four and Gabriels in the last three.) Nelson, whose other work includes Two Shakespearean Actors and The Dead, has responded with two altogether brilliant play cycles. The capstone of Women of a Certain Age--and the entire Gabriel and Apple series--is Ms. Plunkett. A talented actress who made a startlingly good dramatic debut in 1982 as Amanda Plummer's replacement in Agnes of God and shortly thereafter revealed musical abilities in Me and My Girl (winning the Best Actress in a Musical Tony in the process), our attention almost seems to have been riveted to Plunkett throughout the Gabriel plays. This might be intentional on the author's part, or not; in any event, Plunkett makes Mary so real and her problems so immediate that actor and character seem the heart of The Gabriels. Following the run of Women of a Certain Age, the full Gabriel trilogy will be presented at the Public on five marathon dates in December; and the productions will transfer to Kennedy Center starting January 7, 2017. The plays are not to be missed, while Nelson's hand-picked band of sterling actors will be missed.